A stunning transformation in the heart of Tulsa's historic district. For self-taught designer Emily Netz, flipping homes is a real point of passion. So when the opportunity to renovate her own house presented itself, Netz took on the challenge without so much as a second thought. 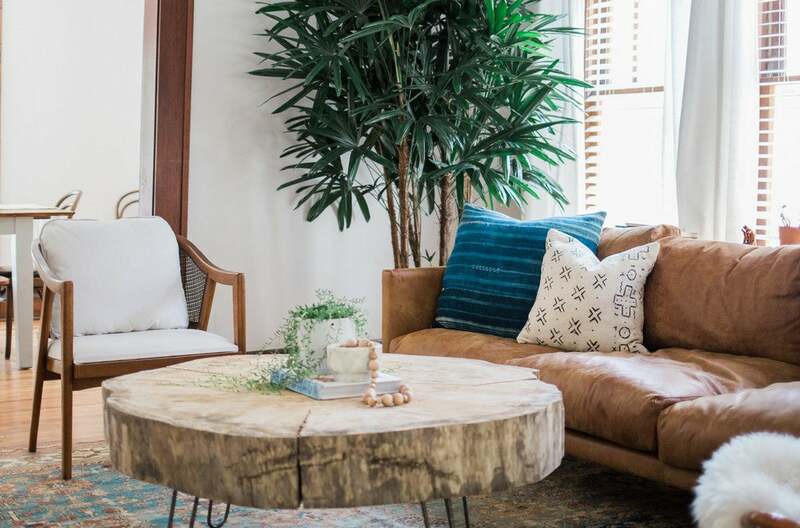 Situated in the historic district of Tulsa, Oklahoma, the three-story home’s origin can be traced back to the 1920s—in fact, Netz and her growing family of four would become only the third owners of the home in nearly 100 years. The property’s historic charm was not its only selling point, it also happened to be a Sears Roebuck Kit house. For a little over 30 years, beginning in 1908, Sears unveiled a series of mail-order homes offered in a diverse array of sizes and styles, which dwellers would be able to construct themselves. Before they were discontinued in the ‘40s, it was reported that over 70,000 of said kit homes were sold in the United States. Netz and her family were one of the lucky ones to stumble upon this rare find. It should obviously go without saying that the space in question would come to require quite a few modern updates. We caught up with Netz to get the complete lowdown on the unbelievable transformation that ensued, ushering the home into the 21st century. Take a look! The laundry room would later be, conveniently, relocated to a large hall closet upstairs. Understandably, the renovation took quite some time and the family had to wait several months before finally moving into the home. Gutting the kitchen and bathrooms in their entirety were two of the more time-consuming aspects of the project as an emphasis was placed on salvaging as many of the original features as possible. In an effort to preserve the wooden floors, which were dark and worn out, they were sanded down and treated with a simple clear poly, one that would allow the original features of the grain to stand out. A similar form of treatment was reserved for the wood trim, which could be found throughout the downstairs portion of the home—the remaining architectural elements of the home were given a fresh coat of paint, one that provided the space with an instant burst of life. Take a peek throughout the home and you will notice an overarching theme that alternates between a mix of mid-century modern with a hint of Cali-cool. The general aesthetic of the space is one that embodies an air of effortless comfort, all the while remaining kid-friendly and relaxed. “I’m always changing things up and adding in fun pieces that I find at the flea market or even on Facebook marketplace,” notes Netz of her affinity for mixing style with a personal touch. In the living room, the original trim still stands strong, one that Netz was insistent on preserving during the remodel. “Because the trim work was so dark and beautiful, we definitely wanted to keep it that way,” she notes. “However, because there was so much of it, it made the space feel pretty dark.” In order to lighten up the room, the couple decided to sand down the dark-stained wood floors, which revealed the original layer that was comprised of a stunning red oak. After sealing it with a matte clear polyurethane, they took to the walls with a fresh coat of white paint to establish a delicate contrast between the two tonal elements. With a handful of strategically placed mirrors that reflect light throughout the space, the living area was instantly refreshed. When it came to the decorative details, Netz brought in a slew of textured accent pieces of a complementary color scheme and paired them with furnishings of a delicate neutral scheme. In the kitchen, the couple custom-built cabinetry, which would mimic the original installation, which unfortunately was not salvageable. And they did just that, opting for flush inset shaker-style doors aesthetically offset by plain-front drawers. Antiqued brass hardware was reserved for the knobs, handles, and hinges of the cabinetry, all of which brought on an element of warmth to the neutrally-charged palette of the renovated kitchen. “The whole space was designed to be purely simple and reminiscent of the 1920s while still providing all of the modern conveniences of today,” adds Netz. Said practice of maintaining the historical integrity and characteristics of the home’s original structure is one that also parlayed into the bathroom. Luckily for the couple, they were able to salvage and restore the original clawfoot tub, reserved for the upstairs family bathroom. As for the contemporary addition, a standing, glassed-in shower was also brought in to complement the space. And since the bathroom had to be completely redone, the couple did their best to replicate the original tiling when it came to the flooring. The finalized spot came to feature a mix of whitewashed subway tiles—reserved for the backsplash—that seamlessly blended into the background and mini hexagonal tiles, in a similar hue, for the flooring. While the palette of the bathroom embodies an exclusively all-white scheme, the textured area rug, mid-century modern vanity, and hanging greens provide more than their fair share of color and interest to the space. With the vanity being one of the more standout pieces in the room—in our humble opinion, of course—was a 1960s dresser, which Netz’s husband ingeniously reconfigured.